On the south of the cloister the refectory saw the monks for two good meals a day, which were eaten in silence apart from the monk whose turn it was to read aloud from the bible. The kitchen, where the meals were prepared, was on the west end of the refectory. Nothing remains and nothing is known of the kitchen apart from what is known from other monastery sites. Places where you can see a monastery refectory still standing are at Glastonbury Abbey and Durham Cathedral. 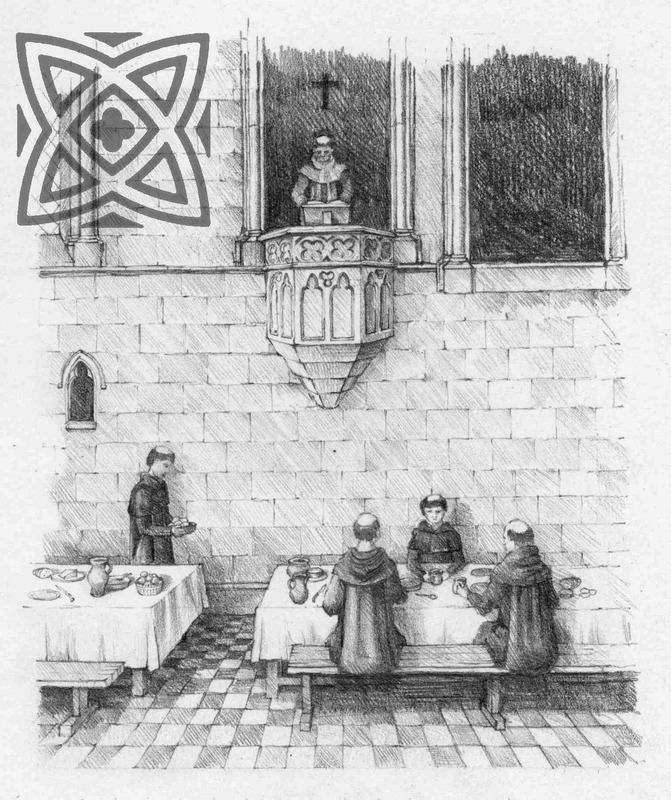 An imaginative reconstruction of the monks eating in silence in their refectory. Copyright Reading Museum Service (Reading Borough Council). All rights reserved. Should we be able to join the monks at the basins in the south Cloister walk, washing their hands before their meal and filing into the large Dining Room, or Refectory to the south, we would have been struck by their silence. For silence was observed here in this time of relaxation as much as during their duties in Church and Cloister and work about the monastery. During the meal the only human voice was from one of the monks reading aloud a passage of scripture or the life of a saint from a lectern built out from the wall. The monks sat on wooden benches at long wooden tables and ate with knife, spoon, fingers and napkin, no forks. At the cast end of the room was a platform where the Abbot had his meals when he ate here. The food was served by the monks in a rota from the kitchen at the west end. Meat was never eaten in this Dining Room. The mainstay of the diet was bread and vegetables with an emphasis on beans; there were also eggs, cheese, oysters and fish, and the flesh of birds was not counted as meat. The monks had wine to drink and a heavy and a lighter beer. Usually there were two meals a day, the first about mid-day (no breakfast), the last approaching sundown before the final service in the Church. But on Fridays and fast days including Lent, approaching half of the days of the year, there was only the one meal. The diet of the monks was therefore frugal compared to what we enjoy today. Despite this their health was good, they lived long and indeed their diet would be commanded by nutritionists nowadays who warn us against the health problems we cause ourselves by overeating. 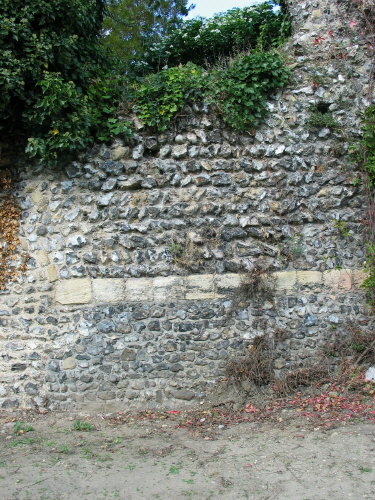 The sanitation at the Abbey was excellent compared to what was found in the town of Reading. The toilet and bathroom block of the monastery, the Reredorter, Necessarium or Necessary House, was situated by the river to the south of the Dormitory, with water from the Holy Brook running through to flush away the sewage. Citizens of Reading made do with cess pits in gardens and backyards which were often dangerously dose to the wells from which they drew their drinking water. The refectory, one of the largest rooms in the Abbey, was sometimes used for other events than meals. Parliament in those days met in London but also in major towns around the realm. Reading was one of these towns. Click on the thumbnail picture to see the large size image of Parliament at Reading in 1453. Copyright Reading Museum Service from "Reading Abbey", published by Reading Museum & Art Gallery 1988.